Eleven Madison Park is currently ranked as the tenth best restaurant in the world.1 Despite this achievement, it remains a work in progress, restlessly changing its format.2 While maintaining the level of its fine cuisine, distinguished by reductions, foams, and creative combinations, it continues to introduce different themes, taking the narrative in new directions. Perhaps believing that it gets in the way, the restaurant has deconstructed the traditional menu in an experiment yielding mixed results. 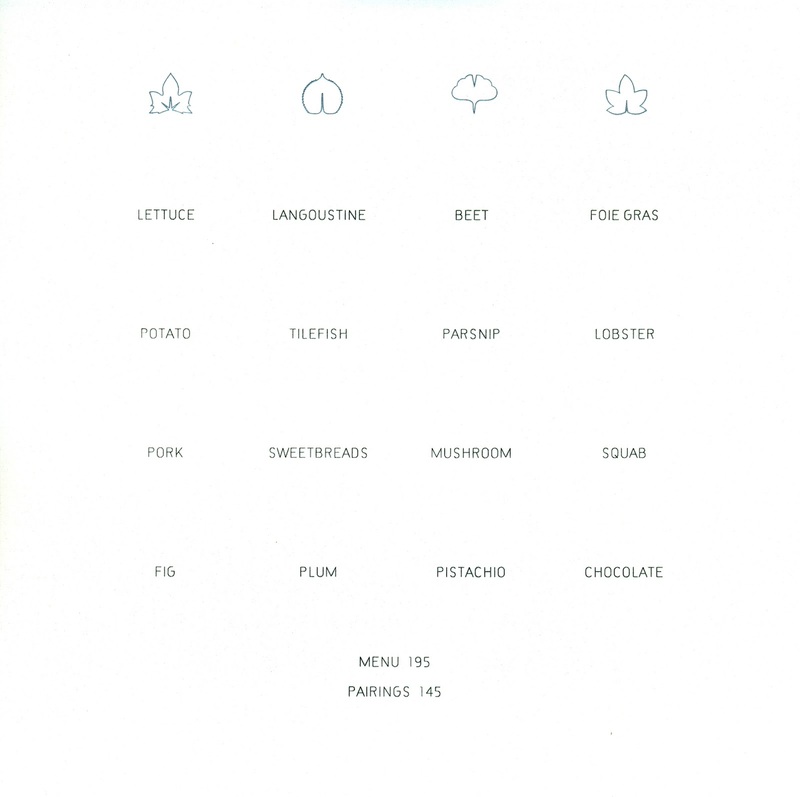 One purpose of a menu is to show what is available. 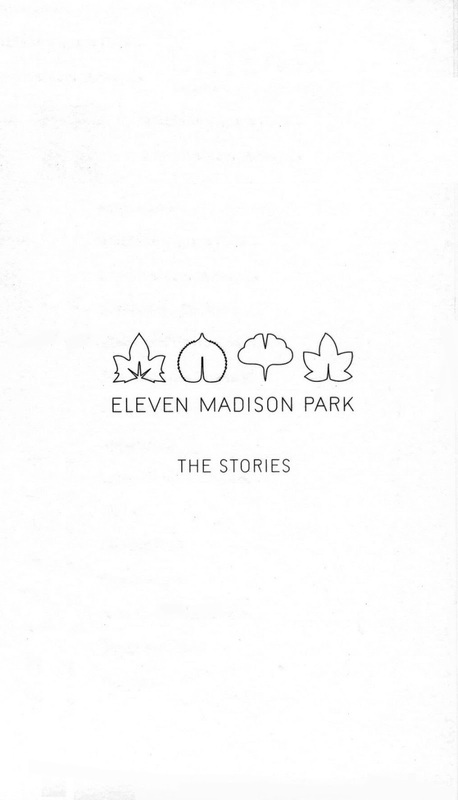 Eleven Madison Park has gone exclusively to a tasting format, where the diner selects four dishes using a 16-word menu card, previously reviewed here in October 2010. You are asked to pick one item from each line, except for the third line, where you have the option of substituting a lavender and honey-glazed roast duck (for two). Interestingly, the 8- x 8-inch card shown below fails to provide some of the most basic functions of a menu. For one thing, it is hidden under a napkin on the plate. Sociologists tell us that the process of dining out begins when you are handed a menu, not when you are greeted at the door. By ignoring this scientific observation, the restaurant unwittingly imparts its patrons with a slight sense of disorientation at the beginning of the meal. A menu can also serve as a memento. 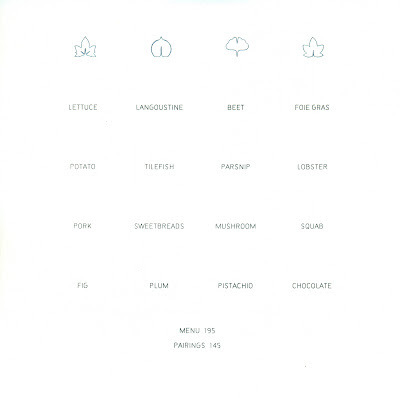 Recognizing that their minimalist menu is not especially suitable for this purpose, Eleven Madison Park presented us with a 32–page booklet as a souvenir, recounting the stories that inspired their themed dishes. 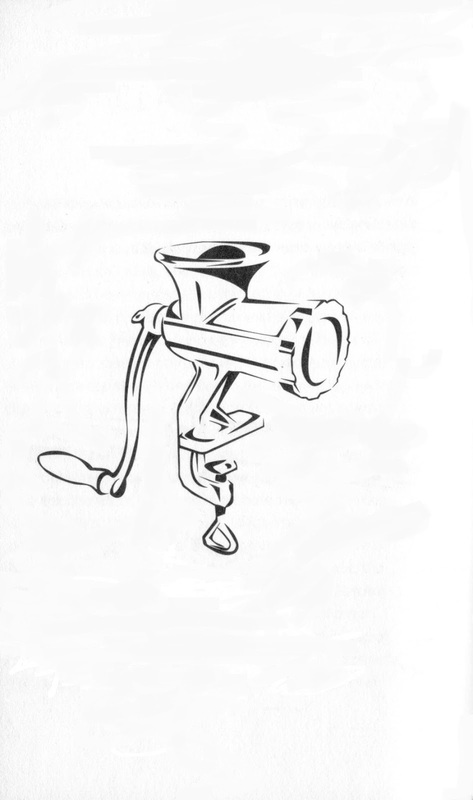 As an example, the vignette shown below marked the arrival of a dish that might be described as carrots tartare. This particular story is about the steakhouses of New York. As you can see, the word “carrot” does not appear in this prolog which was carefully recited by the server as he clamped a meat grinder to our table. Naturally, it came as a surprise when he returned holding a bunch of carrots by the stems. “This was Eleven Madison Park’s tribute to Manhattan’s temples of beef: bright orange mush that you might feed a baby,” reported Wells. “There was more to it than that, of course. (Chef) Humm is a wizard with vegetables; I don’t think there’s another New York chef cooking at his level who can tease as much flavor and beauty from them. So by the time I’d mixed the carrots with the garnishes that stood in for the traditional steak tartare extras, then applied a few drops of mustard oil and carrot emulsion presented in plastic squeeze bottles, I had one of the most surprising, inventive carrot dishes I’ve tasted in a long while.” Nevertheless, Wells was somewhat disappointed, explaining that the recitation had primed his taste buds for porterhouse. Two years ago, I suggested that they name one of their dishes as a clever allusion to an everyday food. The idea was to provide an amusing note of affectation on the menu. However, when repeated almost a dozen times, such commentary runs the risk of being perceived as artifice, especially when it is designed to deceive. Affectation requires a lighter touch to be seen as whimsical. After all, when Marie Antoinette strolled over to her rustic cottage at Versailles, she playfully milked a cow, not the entire herd. By contrast, Eleven Madison Park is developing new themes without changing its elegant interior. Nevertheless, they are playing with the boundaries of the experience, taking it beyond the large dining room overlooking the park. Indeed, many of the features of the format we experienced depended on the element of surprise, something that will be difficult to sustain in the Information Age. The fixed price for lunch or dinner is $195, not including wine, tax, and tip. In other words, it costs about the same as a good seat at the opera, and the entertainment lasts about as long—somewhere between 3½ to 4 hours. To take this analogy one step further, the tasting menu reminded me of Donizetti’s The Elixir of Love, the Met’s opening opera this season, for there are marvelous potions in both productions. Of course, there are many differences. For one thing, the Met provides its patrons with a full synopsis of the opera, while Eleven Madison Park describes its complex drama in only sixteen words. 1. Organized by Restaurant magazine, the annual list of the World’s 50 Best Restaurants is based on input from over eight hundred industry experts. 2. 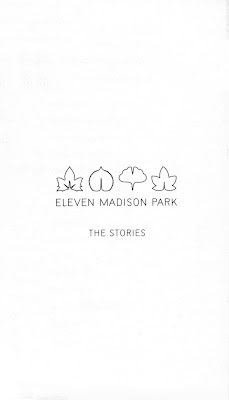 The format at Eleven Madison Park is constantly changing. This essay reviews the lunch service on 15 September 2012. 3. “When Words Fail,” and “Where the Words Fail the Dishes,” New York Times, 19 September 2012. 4. 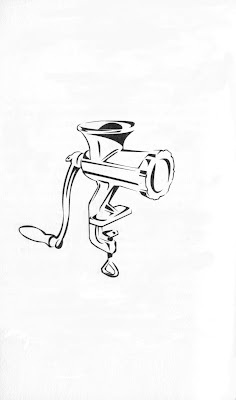 “Check, Please,” The New Yorker, 9 September 2012.